The Wonder Stuff’s singer and violinist embark on series of live dates, making their debut visit to The Apex on Wednesday 18 November. The acoustic show by Miles Hunt, and Erica Nockalls will include tracks from their own albums in addition to Wonder Stuff material and the occasional cover version, all interspersed with Miles' trademark inter-song banter. Alternative rockers The Wonder Stuff burst onto the indie rock scene in 1987. Their blend of catchy pop hooks and punk rock attitude, combined with a large dose of self-deprecating lyrical wit, gave them instant cult status. The band are probably best known for their two biggest hits: ‘Size of a Cow’, which reached number five in the UK singles chart, and their cover of Tommy Roe’s ‘Dizzy’ (featuring comedian Vic Reeves as guest vocalist), that saw them reach number one. The band split up in 1994. Miles Hunt went on to form Vent 414, and then worked as a solo artist and as an MTV presenter. He has released three solo(ish) albums – ‘Hairy On The Inside’ (2000), ‘The Miles Hunt Club’ (2002) and ‘Not An Exit’ (2007), as well as various live albums. Erica Nockalls is well known for her role as violinist with The Wonder Stuff and The Proclaimers; she also formed her own band to tour her debut art-rock album ‘Imminent Room’. Miles reformed The Wonder Stuff for a Christmas show in 2000 and the band have continued to gig sporadically since. They are planning a full tour to support the next album, due out in March 2016. But, in the meantime, you can get your Stuffies fix when Miles & Erica play at The Apex on Wednesday 18 November at 7.30pm. 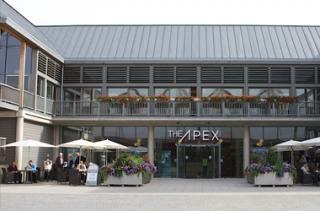 Tickets are £20 in advance, call the Box Office on 01284 758000, or visit www.theapex.co.uk for more information, or to book. Pilgrims Kitchen welcomes all visitors into a great new place to eat and meet.